This is a closeout style from Easy Care. Inventory limited! E-Z Ride Stirrups are the #1 long distance stirrup! These powder painted, aluminum stirrups rate the highest in comfort and quality. The wide, deep, comfortable foot bed allows excellent pressure and weight distribution throughout the foot. The foot bed is covered with a thick closed-cell foam. The topbar deadens the shock forces transmitted from the horse and rider's movement. 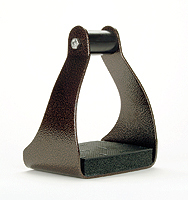 These stirrups help maintain comfort and stability during long hours in the saddle. Top bar: 1", 2" or 3"
These have been discontinued by EasyCare! Limited Quantities!! !